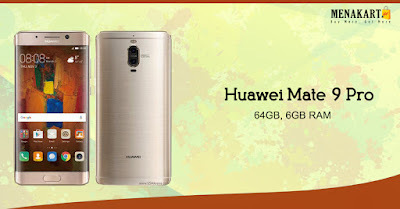 Online Shopping in Dubai: Buy Huawei Mate 9 Pro online at Menakart. Up to 17% off! Limited offer! Hurry up! Buy Huawei Mate 9 Pro online at Menakart. Up to 17% off! Limited offer! Hurry up! Huawei Mate 9 Pro Dual Sim is a phone made for those who are in love with technology. The epitome of Huawei’s craftsmanship, this phone, as Huawei affirms, is a step ahead. The Huawei Mate 9 Pro brilliantly combines high-performance with a breathtaking design. Flaunting a dual curved design and a compact body in an elegant gold, this Huawei Mate 9 Pro Dual Sim is a piece of technological art. Huawei designed this phone just for you.